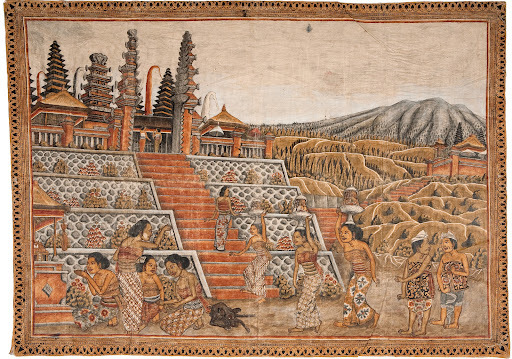 I Nyoman Mandra was the leading artist of the ‘classical’ school of Balinese painting, the art of the village of Kamasan, Klungkung (East Bali). Born in 1946, Mandra comes from an important family of artists, as his maternal grandfather was Rambug (c.1850-1925), probably the best of the painters working in the late nineteenth and early twentieth centuries. His uncle was Nyoman Dogol (1875-1963), one of the leading painters of his generation. Both Rambug and Dogol were leaders in earlier renderings of the Kerta Ghosa, the famous “Justice Hall” of Klungkung, which was originally painted in the nineteenth century, and then completely repainted in 1918 and 1933, before the main parts of the current version were re-worked in 1960 under the leadership of Dogol’s colleague, Pan Seken. The neighbouring garden pavilion Taman Gili (“Island Garden”) was painted by another colleague, Wayan Kayun (1878-1956) around 1943. The Kerta Ghosa remains the most famous monument to Kamasan art, and Mandra was also involved in repairs to the Kerta Ghosa in the 1980s. He is currently being consulted about plans to restore all the paintings. Keeping alive the tradition of Kamasan art is Nyoman Mandra’s main motivation. Remembering his impoverished childhood, when he studied from his uncle by sketching images in the sand, he established his studio as a teaching centre so that young people in the village would have ready access to painting methods, materials and techniques. Mandra has also been the person to whom outsiders have gone when seeking information about the village, especially commissions of large productions by the village’s artists for major tourist sites, such as the refurbishment of the Grand Bali Beach Hotel in the 1990s. His guest book includes Indonesian presidents, foreign heads of state, and foreign researchers. As well as prominent pupils such as I Wayan Pande Sumantra (b.1966), one of Nyoman’s star students has been his own daughter, Ni Wayan Sri Wedari (b.1974). (From Adrian Vickers).